Orionmac's Magic Knight Rayearth Page! Welcome to Orionmac's Magic Knight Rayearth Page! Umi, my personal favorite character! New OVA info added! Check it out! Warning: spoilers ahead. Read at your own risk! Wow! After forgetting about this page for a year or so come back to check and find that people are still visiting this page! Therefore I've decided I am going to begin updating this page again. Just don't hold your breath: I'm not going to upload any full episodes anytime soon though. Anyway, thank you all for your support! There are 49 episodes and 6 manga comics made about Rayearth so far. A three-part OVA series has also been released. Magic Knight Rayearth is here in America! You can get the DVD memorial box at your local video store, or order online from vendors such as DVD Express! 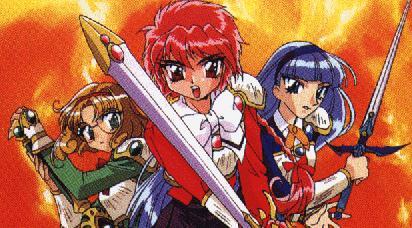 Magic Knight Rayearth for Sega Saturn - the last game made for the little console that couldn't. Click here for more info on this awesome RPG from Working Designs. Playing lately on my playstation: Final Fantasy IX! Squaresoft has made the best RPG ever for the playstation. Check out my new Nadesico Page! Check back for new stuff and updates! Your source to Rayearth Information on the Web! Magic Knight Rayearth is an animation series featuring three 14 years old girls who are transported to the magical world of Cephiro by the Princess Emeraude where they must embark on a quest to save the kingdom from the evil tyranny of Zagatos. The three main characters are: Hikaru, an athletic and energetic girl who looks like a 11 year old; Umi, a beautiful girl who appears selfish on the outside but who actually cares deeply about her friends; and Fuu, an intelligent and mature girl who smiles all the time and finds the best out of every situation. They are helped in their adventure by many people such as Clef, the boyish magician; Ferio, the brash young knight who Fuu has fallen for; and Presia, a beautiful weapons maker who tragically dies after finishing the knights' weapons. Of course, how can anyone forget the lovable Mokona? Clef tells the three girls that the only way to save Cephiro is to become true "Magic Knights", and to do that they must obtain their weapons from Presia and wake up the three "God Machines". Wishing to prevent the three from becoming true Magic Knights, Zagatos sent his generals and servants to do battle against them. First, a dark lady of magic, Alcione, was sent to prevent the three from reaching Presia. Alcione, however, was unsuccessful in stopping the knights from obtaining their weapons from Presia and faced a harsh punishment from Zagatos afterwards. Then, the boy monster caller, Ascott, was given the task to destroy the knights. Although his monsters killed Presia, Ascot was touched by the knights', especially Umi's, love and kindness, and became a friend. Caldina, a pink-haired illusionist, is the third enemy the knights faced, but she also became a friend after being touched by Ascot and the knights. Zagatos' loyal servant, Innova, tried to stopped the knights from reaching the three "God Machines" next, but was defeated by the knights with the help of Ferio. Lafarga, a former captain of the home guard under Princess Emeraude, was put under Zagatos' evil spell and forced to do battle with the three knights. His spell, however, was broken during the battle, and he also became a friend of the knights'. Zagatos, seeing that all his subjects have failed, decided to battle the knights himself. At this point, the knights have already waken the three God Machines and were on their way to Princess Emeraude's palace where she is kept prisoner. A fierce battle began, and through their will and determination the knights were able to defeat Zagatos and rescue the kingdom of Cephiro. The war wasn't over however, as the knights find another enemy before them in the form of Princess Emeraude. The truth behind Emeraude and Zagatos is finally disclosed, revealing that the princess and her former general, Zagatos, were in love. However, Emeraude is the "pillar" of Cephiro, in charge of maintaining stability and peace in the kingdom. Her job does not allow any outside influence for fear of her losing concentration. However, her love for Zagatos was too strong, and she was unable to keep her mind from thinking about him. This led to the deterioration of Cephiro, and her imprisonment of herself in order to force her thoughts away from her lover. Now, the loss of Zagatos resulted in a complete breakdown of her mind, and she changes from a child-like state to an adult one, full of anger and vengeance. The knights faced the greatest enemy ever in the face of the one who summoned them to Cephiro, and they are reluctant to strike the princess. However, the princess begged them to kill her and end her suffering, and to save Cephiro from destruction. With tears in their eyes, the knights deal the final blow, and returned to Tokyo, filled with sadness and grief. The second part of the series begins with Hikaru having a dream about a new evil force threatening Cephiro. Afterwards, when the three knights meet again at Tokyo tower, they are once again summoned to Cephiro. There they find Cephiro completely changed, due to the absense of Princess Emeraude, and the country under siege by the neighbouring countries of Autozam, Chizeta, and Farem. The friends of the knights have gathered and created a palace to protect themselves from the crumbling Cephiro. Mokona, Clef, Ferio, who is actually Emeraude's brother, and Presia, who seems to have come back to life, along with Ascot, who is an adult now, Caldina, and Lafarga are all safe within the palace. The knights also meet Lantis, the brother of Zagatos, who Hikaru falls in love with, and Primera, the fairy whose life was saved by Lantis years ago. Cephiro is crumbling due to the lack of a pillar to support the land, and the knights are determined to find this new pillar and also repulse the invaders. Autozam's forces are led by Eagle, who is a former friend of Lantis. His sidekicks, Geo Metro and Zaz Torque, helped him prepare his mecha, the FTO, for battle. Chizeta's forces are led by Princess Tata and Tatra, two magicians who came from the homeland of Caldina. Farem's forces are led by Princess Aska, a child who acts like one, and is determined to become the next pillar of Cephiro. The knights also discover a new enemy, Debonair, who Hikaru had seen in her dreams, and her "daughter" Nova, who was born from Hikaru's heart during the final battle with Princess Emeraude. Nova and Debonair are determined to destroy Cephiro, and to do that the Magic Knights must be destroyed. Now a new battle begins, between the invading countries' forces, Debonair's demon forces, and the Magic Knights. After many battles against Debonair and the invading countries, the Knights finally befriended all the leaders of the foreign countries and discovered Debonair's hiding place. The final battle takes place in Debonair's dimension, where everyone, including the former enemies of the knights, helped the knights overcome Debonair and restore Cephiro to its former days of peace. The knights return home again, this time with smiles on their faces. By the way, the Anime and the manga have different endings, so it may be worthwhile to check them both out! The OVA series takes place in an 'alternate' universe, meaning although the characters are the same as the TV series, the storyline differs completely. In OVA #1, we are introduced to our three heroines, who are currently in their final year of junior high. After graduation, the three will have to seperate, and that feeling of not wishing to leave one another forms the basis for their reason in fighting against the invading army of Cephiro. Cephiro, led by Princess Emeraude and her brother, Eagle, are determined to invade Rayearth (or what they call our planet) and they've sent their trusted servants, Ferio, Ascott, and Alcione to help them accomplish the job. The only people who stand in their way are Clef and Lantis. After Hikaru has a strange vision involving Mokona, she discovers a hidden power inside of her, and after under-going a 'test' from her 'machine', she becomes the pilot and defeats Alcione. However, when she tries to destroy Cephiro's fortress, Eagle repels her attack and greatly hurts her in the process. OVA #2 deals mainly with Umi and Fuu's tests to obtain their machines and their battles against Ascott and Ferio, respectively. Through their determination and will for Hikaru's safety, the two are able to defeat their opponents (with some help from Clef). Meanwhile, Hikaru finds herself trapped with Lantis, who has imprisoned her inside a crystal maze in order to find out her 'true strength'. OVA #3 begins with the three friends reuniting once more, and with help from Lantis and Ferio fights against Eagle, who's piloting Zagatos' machine (Zagatos is a priest who had to sacrifice himself in the OVA). After a long battle sequence, the three finally defeats Eagle by combining their machines into the legendary machine, 'Rayearth'. In the end, Princess Emeraude and Eagle retreats from Earth, and the three knights depart from each other under the blossom tree. For those of you who've seen the series, I greatly recommend watching the OVA also. The animation is superb and the voice acting is outstanding. Although the story may leave some of you feeling cold, it should not hinder your enjoyment of the OVA at all. The, uh, interface between the girls and their machines is 'interesting', allowing far more 'service' for the male audience than necessary, but I don't think any of the guys out there would complain. Overall, Clamp has made a great TV series and OVA series, both of which I recommend whole-heartedly. One more thing: With the release of the DVD Box Set there's no better time than now to get the entire series on the format of choice! Sci-fi and anime galore; still under heavy construction. My page on Nadesico! Check it out! A site dedicated to the main female character of Final Fantasy VIII. This page has many, many links to non-Japanese Rayearth sites on the web! A very nice page about Rayearth and other animes. One of the best Anime link site there is on the web! Nice page with info on many anime series. A spiffy page. Has some info on anime series. All images found on this web site is found on the Net and considered public property. Magic Knight Rayearth and Rayearth is copyright of CLAMP.